Most known for: Being the only Undead Kria's brother hasn't re-killed. Personality: On a good day, Devin comes across as snarky, quick-tongued, and quick to insult. On a bad day, one would just assume he is a downright jerk. Those who get to know him tend to realize his taunts are more in jest than anything truly serious...but combined with his Undead nature, most strangers tend to avoid being around Devin too long. 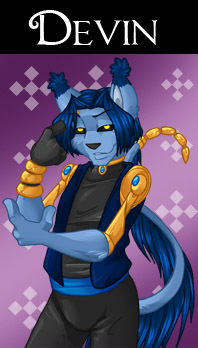 Devin currently occupies his time with maintaining Kria's mansion while Kria is off and away and is in many ways considered one of Kria's most trusted advisers. As such, he often isn't seen wandering too far about as most tend to have a negative reaction to Undead, including Kria's brother. Devin's personality is a bit of an issue due to the nature of his Undeath. Being one of the first Undead before sentience was re-gained, and having had to create his personality from scratch once he did regain sentience...it is unknown if Devin's soul is that of the original being or if it is an all new individual entirely. Either way, Devin seems to not care. History: Devin's history is a bit of a mystery to most. He was one of the first Undead constructs created by Dark Pegasus back in the time DP was still learning how to channel the forces of such magic. As such, the vast majority of Devin's existance had been of a mindless servant. It is known that Devin was given to Kria by her brother at her request and for the longest time he had been a servant in her mansion. However the event that caused all the Undead to first rise up had a secondary effect in that all previously created Undead also gained sentience. Unfortunately in Devin's case (as well as many Undead who were created before the event), the time between his death and such an event was far too distant and it resulted in Devin coming into sentience with no memories or personality whatsoever. While most took this as a chance to dispose of their Undead creations, Kria took it upon herself at that time to re-teach Devin to the best of her abilities and as such considers him almost akin to her son, even extending her last name to him. Since that time, Devin has been a member of the Soulstealer household, though prefers to keep a low profile. Quirks/Fun Facts: Devin's upper arms were badly damaged in an incident and thus the bones were gold plated. He can now remove them at will. Devin is the fifth oldest Undead on record. About 10% of all of Devin's income goes into maintaining a fluffy soft tail. Devin is the only Undead who Dark Pegasus has not tried to kill on sight. Devin has a bad habit of over-spicing food due to his own severe lack of taste. Devin's Quote: Don't make me slap you from over here, I can likely reach you.